Home Healthy Feet Foot Pain? Does the shoe fit? 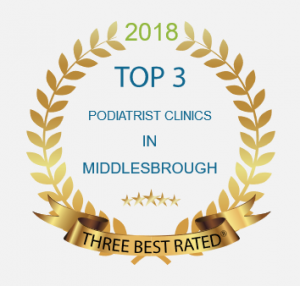 Did you know that many foot pain problems are actually caused by either inappropriate footwear, or incorrectly fitted footwear. Inappropriate footwear could be wearing unsupportive footwear whilst walking across uneven ground, or wearing a pair of trainers to play football or a wet grass pitch. 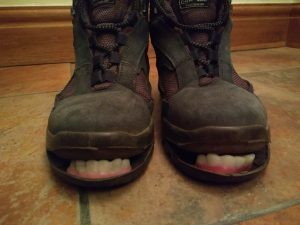 Incorrectly fitted footwear can be either the wrong size (too small, too big, too narrow), or simply not fastening your laces up correctly / tightly. If you have lace up shoes, but are able to slip them on and off without undoing the laces, they are not holding themselves onto your feet. Everyone at some point has found themselves sat in a shoe shop with six or more pairs of shoes around them, trying to decide which ones fit the best, but why is this? 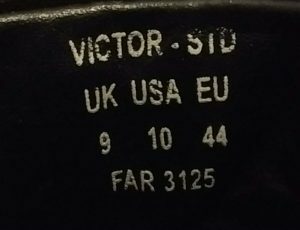 Surely a standard '9' is a standard '9' across all shoes, especially as a 32" waist is the same in all trousers? Think again! Are your shoes hurting your feet? If you find your footwear is nipping your toes, rather then fitting like a glove, you might want to check the size of your feet, and the size of your shoes. It sounds like an obvious statement, but just because you've always been a 32" waist, doesn't mean you haven't put some weight on since you last bought those favourite jeans, which mave have slowly stretched with wear. I ordered Orthotics, not orthodontics! 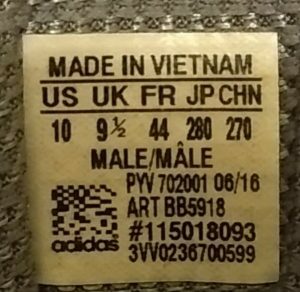 There are so many different manufacturers out there, all originating from different countries, it's difficult to know what is the original size and specification the shoe was made to. 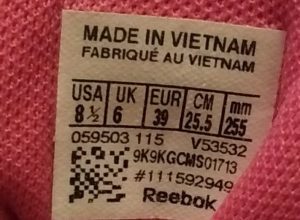 Is it an American company, so all the US sizes should be consistant, or is it a European Company, made to European sizes. 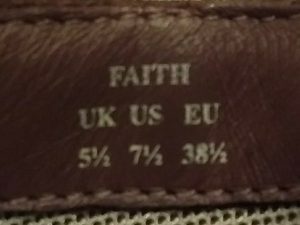 Then there's British companies, where we'd hope everything is made to UK sizes, and labelled to advise of alternative country sizes. 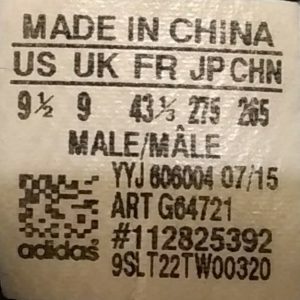 Does the American company have the shoes made in the US, China or Vietnam, and are these consistant? As a general rule, male UK sizes are 1 size smaller than US sizes, whereas females UK sizes are 2 sizes smaller than US sizes. Got it! 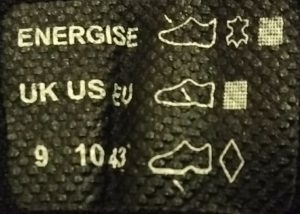 Well, you'd hope that would be the case, but here's a selection of labels from shoes from my own home. Some are mine, and some belong to my good lady Mrs C.
So you can see from the images above, there's a variety in shoe sizes when you look at the different sizes across the different countries. Would you believe that two of those shoes are from the same manufacturer, but have different sizes in the European scale! 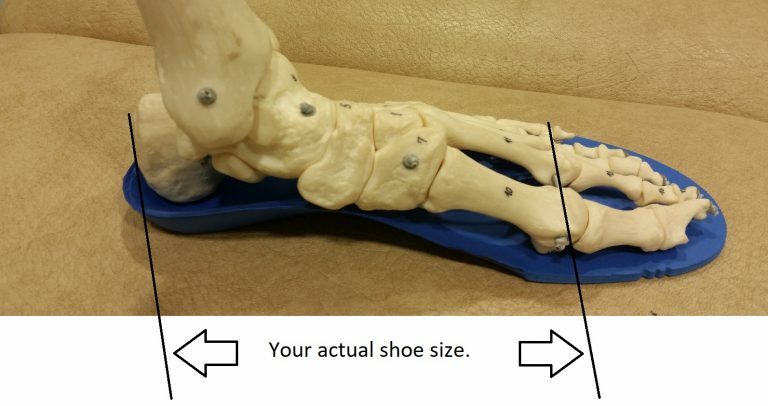 The actual size of your foot is determined by measuring the distance from the back of your heel to the joint of your big toe. Why? Well, this is where the shoe is designed to bend when you are walking , so by making the shoe bend at the correct place, and the rest of the materials move appropriately, your feet should be comfortable for every step. If your feet swell as the day progresses, you may have problems with your circulation. I'd highly recommend visiting your doctor to have this assessed and addressed. However, when it comes to shoes, this can also be a major problem. Trying shoes on first thing in the morning will probably mean they won't fit at 7pm in the evening, unless they have velcro adjustable straps to hold the shoe on. If you are looking for a pair of shoes that you will wear on an evening, then a trip to the shoe shop for a late opening is going to be the best idea. 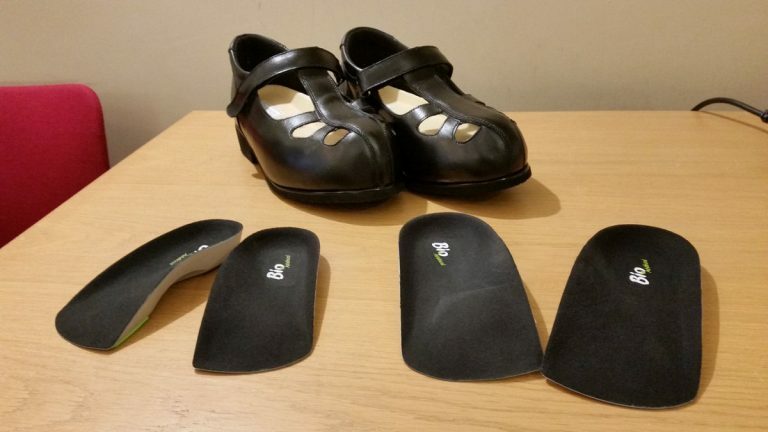 If you have servious problems getting shoes to fit, then it may be time to visit a podiatrist to see if they can help, or recommend a shoe fitter. Are you having a fit? We all know shopping on the internet is 24/7, and quite often next day delivery, but when it comes to shoes, do they alway fit correctly when they arrive? I personally never buy online, as I know I need to try on the shoes to make sure the size of the shoe fits the size of my feet. Also, when you do go into a shoe shop and spend time trying the shoes on, BUY the shoes from the shop. Yes, you could sneak a photo of the box and model number then go online and order, but remember, the shop has provided the service of fitting the shoes, given you a range of shoes to try, and spent their time serving and helping you. They deserve your custome, and if everyone simply tries on, then buys online, very quickly the shoe shops will shut! Remember that 20 - 30 minutes in a shop will be quicker than taking time out to spend time at the post office sending shoes back that didn't fit. If you need help with any foot problems, please call my clinic and make an appointment.